Cleansing your body is a daily requirement that helps to retain healthy skin and ensures that you smell pleasant. But there is one particular area that is often being neglected due to the fact that it cannot be reached well. Your hard to reach back. You need a tool to wash your back in the shower! We encounter many problems when attempting to wash our back. No matter how far you might be able to reach with your arms, there is always that one spot on you back you just cannot reach with a regular wash cloth. You can reach past your neck and behind your back and stretch until you pull a muscle but yet, your chance of success is rather limited. This is a bigger problem for those with are unable to raise their hands over their shoulders or have arithritis. In addition, just the water from a shower head will not do the trick, especially if you have acne-prone skin. However, that does not mean your back should stay dirty. Handicap washing aids can help all sorts of people by allowing for more reach. There are different types of methods, scrubbing tools, handicap bathing aids and cleansing back washing aids that can assist in scrubbing your back. A long handle back brush, a bath sponge or a back scrubber featuring a large handle is perfect to reach all the way up and down your back. This is great for someone who has limited mobility in their shoulders or is a larger individual. You can use long back straps with handles on either end in a back and forth motion to scrub your back quite well. They even remove dead skin cells to reveal beautifully soft skin. This is great for exfoliating the skin and washing back acne. It covers a large portion of your back with every scrub. 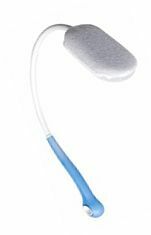 Buy this Back Scrubber That Exfoliates and Cleanses. It has a lot of soft gentle bristles that build up a lather quickly while exfoliating the skin. The reverse side has nubby mounds for circulation and stimulation. A great massager! For a simple wash your back product, consider a rolled up towel. The rolled up towel is the most inexpensive way to clean your back. Just use a long towel, roll it up vertically, and use it as you would a loofah back strap after soaking it in water and applying your favorite body wash or other bath product. Here are more hygiene aids to help you wash your back. Double sided back scrubbers with great reviews. One side has long and short bristles made for exfoliation and scrubbing. The other side is full of nubs for massaging. Fewer injuries from overextending muscles while trying to reach your back. A lesser occurrence of skin problems on your back with frequent deep-cleansing. More independence in taking care of yourself. If you don’t have any of the above available, or if you would like to spend some quality time with your beloved other half, there is always the option of scrubbing each other’s back in the shower or during a bath. Of course in case of someone who might be disabled, a friend or caretaker can help with washing your back as well. Back scrubbers and back straps are available for as little as $1 at a discount store up to around $30 in specialty stores. If money is an issue, however, you can always utilize the free alternatives mentioned. As you can see above with the images, those are the best recommended back scrubbers on the market. Soaps and shower gels fall into similar price categories depending on place of purchase and purpose.